In Denmark, ? – 20th century, a unit of distance, = 24,000 fod, approximately 7.5325 kilometers (4.680 miles). Sometimes called a landmil. 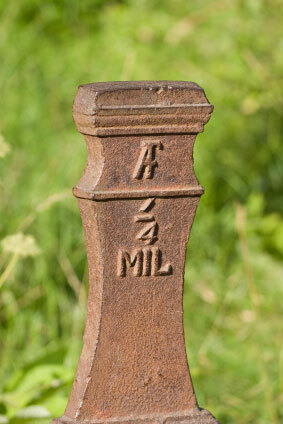 Swedish iron mile marker. The symbol at the top is the monogram of King Adolf Fredrik (1710-1771). In Sweden, ? – 20th century, a unit of distance, = 10 kilometers (about 6.21 miles). Sometimes called a nymil, to distinguish it from the former mil, = 3600 stänger = 36,000 fot, which was about 10.69 km (6.64 miles). In Norway, a unit of distance, now = 10 kilometers. Formerly it was = 18,000 alen = 36,000 fot, about 11.30 kilometers. In Britain and the United States, 19th – 21st centuries, a unit of length, = 0.001 inch. The thickness of plastic trash bags, for example, is usually given in mils. The “mil” is a thousandth part of a British inch. New York: James H. Wood, 1892. In Turkey, a unit of distance, = 1895 meters. In the province of Yaracuy in Venezuela , ? – 20th century, a unit of mass used for bananas, = 400 kilograms. A unit of plane angle used in artillery, equal to exactly 1/6400 of 360 degrees, or exactly 0.056 25 degree, or about 0.000 981 747 704 radian. Symbol, ‰. This is the value used by NATO. A slightly different value, 0.000 999 996 6 radian, was used in France, under the name millième.